"Boaty McBoatface" has executed its most daring dive yet. The nation's favourite yellow submarine swam under a near-600m thick ice shelf in the Antarctic, returning safely to its launch ship after 48 hours away. It was an important test for the novel autonomous vehicle, which was developed at the UK's National Oceanography Centre (NOC). Boaty's handlers now plan even more arduous expeditions for the sub in the years ahead. 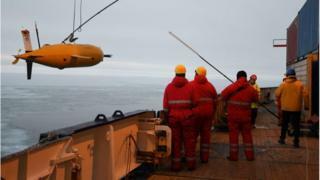 "The reason this mission under the Filchner Ice Shelf in the Antarctic is so significant is that it proves the concept of the new Boaty long-range vehicle being able to do this kind of work," explained Prof Russell Wynn, the chief scientist for NOC's marine autonomous and robotic systems. "Although this was only a 48-hour mission, it was very high risk because of the nature of the environment. "I could very easily have been talking to you now having lost Boaty under the ice and having no way of getting it back," he told BBC News. The name Boaty McBoatface was what the public in an online poll wanted to call the UK's next polar ship, the RRS Sir David Attenborough. The government thought that inappropriate but decided to keep the humorous moniker for the autonomous underwater vehicles that will operate from the Attenborough's deck when it enters full service in 2019. NOC is building a fleet of these AUVs. Their real codename is Autosub Long Range (ALR). They have been designed to navigate independently over great distances and have the energy reserves to stay out on mission for weeks on end. Media captionDr Peter Davis: "Boaty enables us to gather much more information"
This most recent expedition was part of the Filchner Ice Shelf (FIS) Project - a collaboration between the British Antarctic Survey (BAS) and Germany's Alfred Wegener Institute (AWI), with NOC providing and running the Boaty model. The Flichner is a vast floating slab of ice that has flowed off the land on to the Weddell Sea. Boaty was asked to swim into, and explore, the cavity beneath the shelf. Dr Adrian Jenkins from BAS was the science leader for the work onboard the launch ship, RV Polarstern. "ALR was deployed about 3km north of a 32km-wide band of land-fast sea-ice that prevented Polarstern from getting any closer to Filchner's ice front. "The AUV therefore had to make a 110km round trip in order to reach a point 20km inside the cavity beneath the 550m-thick Filchner Ice Shelf," he explained. "For both the deployment and recovery, we needed Polarstern to clear holes in 10-15cm-thick new sea-ice. More ice was forming around the ship during the operations. Credit for the safe and successful completion of those operations goes to Captain Stefan Schwarze and the crew of Polarstern." Boaty gathered data on the way water moves through the cavity, measuring temperature, salinity and mixing. This will help scientists better understand how the Filchner will respond if warm water were ever to get under the shelf to begin melting it - something that is happening in other regions of the Antarctic today. Almost a fifth of the land ice on the White Continent drains into the Weddell Sea through the Filchner and its neighbouring shelf, the Ronne. 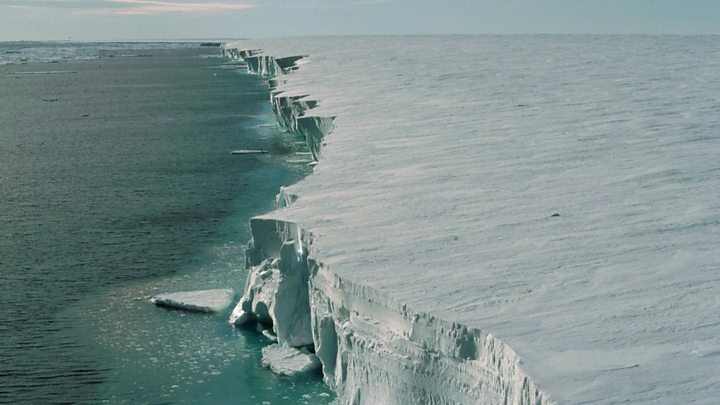 Great basins of ice such as the Recovery Ice Stream would flow faster towards the ocean were it not for the buttressing effect of the shelves. Dr Peter Davis, a BAS oceanographer on the project, told BBC News: "The ice steams cover an area perhaps 10 times the size of the UK. So, the shelves hold back a huge amount of ice. And if they are unleashed, or released, they could result in some substantial sea-level rise that will impact everyone no matter where we are on the globe." One of the next phases of the Boaty development programme will see a new ALR launched from NOC's Southampton HQ. It will head out to explore the so-called Southwest Approaches - those waters off the tip of Cornwall. "In the future, we would love to send Boaty out from somewhere near Southampton to visit the Mid-Atlantic Ridge, to go and do sampling and imaging, collect measurements and come back completely autonomously," said Prof Wynn. "This would start to take the expensive ship out of the equation, and that means we could get more science for the budget available." UK Science Minister Sam Gyimah commented: "Global warming is one of the greatest challenges we face today. Boaty's maiden under-ice voyage provides scientists with a greater understanding of the changes that are occurring in Antarctica, which could have a colossal impact on our planet - but, this is only the tip of the iceberg. "The government is committed to doing more and, through its ambitious Industrial Strategy, we are revolutionising industries and society by shifting to clean growth economies - ensuring the UK is leading the way in tackling climate change."